Phil Schiller, Apple’s senior vice president of worldwide marketing, took the wraps off the new iPhone for press gathered at the company’s San Francisco event, calling the device “the most beautiful product we’ve ever made, bar none.” The iPhone 5 is made entirely of glass and aluminum, Schiller said, adding that the “exacting level of standards” exhibited by the phone is Apple’s best hardware engineering to date. It’s the thinnest and lightest iPhone, at 7.6mm thin, and 112 grams. Schiller said those measurements make it the world’s thinnest smartphone. 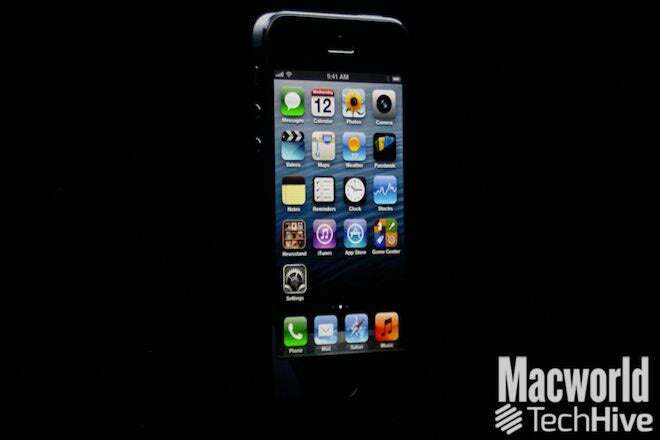 The iPhone 5 is also volumetrically smaller than the iPhone 4S. 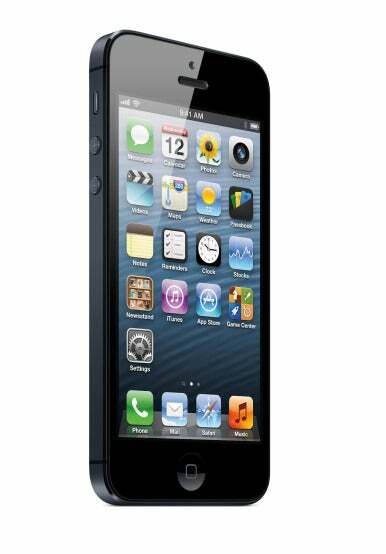 The iPhone 5 keeps the Retina display moniker, but it’s taller than the screens on iPhones that preceded it. The display offers 326 pixels per inch, with a 4-inch screen and 1136 x 640 resolution. There’s now a fifth row of icons on the taller home screen, and all of Apple’s native apps, along with the iWork and iLife suites, have been updated on the iPhone 5 to take advantage of the larger display. Apps that aren’t updated don’t stretch or scale, Schiller said. Rather, such apps will display letterboxed on the iPhone, with black borders surrounding the centered app. Schiller showed off apps from CNN and OpenTable, each of which had been updated for the taller iPhone display, adding in new content. In OpenTable’s case, Schiller said, the developers added some of the iPad app’s interface element, since the iPhone 5’s 4-inch screen afforded more space for such niceties. The iPhone 5 offers 44 percent more color saturation than the iPhone 4S, Schiller said, and because the touch sensors are integrated right into the display, it’s 30 percent thinner, with sharper imagery, and less glare in sunlight. 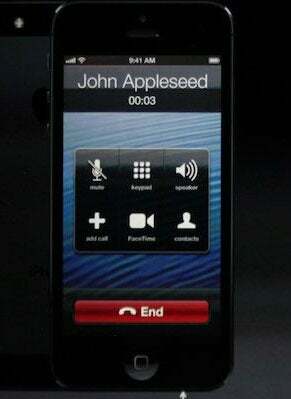 Schiller explained that the iPhone 5 uses one baseband chip for voice and data and a single radio chip. 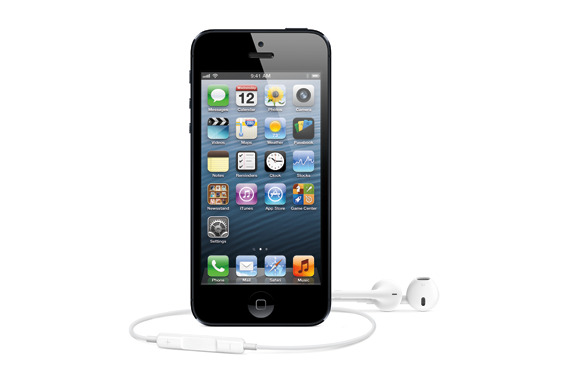 The new phone also improves upon the iPhone 4S’s dynamic antenna, Schiller said, improving its ability to automatically switch to different networks as appropriate. The processor in the iPhone 5 is the brand new Apple A6, which is twice as fast at CPU and graphics processing compared to the A5 that drove the iPhone 4S, Schiller said. It’s also 22 percent smaller than its predecessor, freeing up more space inside the iPhone, and making it more energy efficient to boot. Schiller said that everything—launching apps, viewing attachments, loading music—would be twice as fast as before. Schiller explained that Apple wanted “to match the battery life of the 4S in a thinner and lighter design” for the iPhone 5. The company ended up exceeding that battery life; the iPhone 5 will offer eight hours of 3G talk time and browsing and LTE browsing, ten hours of Wi-Fi browsing, ten hours of video, 40 hours of music, and 225 hours of standby time. 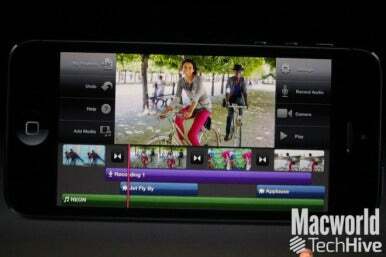 The iPhone 5’s camera sports an eight megapixel sensor, 3264 by 2448 pixel images. It’s backside illuminated, with a hybrid IR filter, five-element lens, and a fast f/2.4 aperture. And the camera is 25 percent smaller than the iPhone 4S’s camera. The camera also includes a dynamic low-light mode, which can sense low light and combine elements for two f-stops greater. The A6 chip includes a new image signal processor, with spatial noise reduction and filtering to improve photographs. And the camera’s now 40 percent faster, too. Also new in the iPhone 5’s camera arsenal is Panorama. You hold the iPhone vertically and sweep your scene; the app tells you at what speed to move. “Even if you’re not perfectly stable,” or if movement artifacts are introduced, Schiller said, the software can compensate in the final image. Video performance is improved, too. The iPhone 5 offers 1080p HD video, improved video stabilization, face detection for up to ten faces, and can take photos while you’re recording video. The front-facing camera is now a FaceTime HD 720p HD camera with backside illumination, a significant improvement over the iPhone 4S’s VGA-quality front-facing camera. 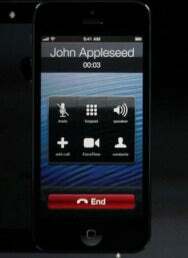 With some carriers, the iPhone 5 will support wideband audio. In a typical cell phone call, the frequency of data in your voice is compressed around the midrange, Schiler said. But that doesn’t sounded entirely natural. Wideband audio fills up more of the frequency spectrum to make your voice sound more normal. Schiller said 20 carriers will support the technology at launch, and didn’t mention any U.S. carriers that would. The 8-signal Lightning connector is all-digital, with an adaptive interface and improved durability. It’s reversible (meaning you can orient it either way, like a MagSafe adapter), and it’s 80 percent smaller than the connector it replaces. 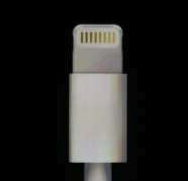 Schiller announced that Apple would offer a 30-pin-to-Lightning connector, but didn’t mention pricing.